Denise and I finished up Day 2 of our Bosque Creative IPT at the crane pools with a decent sunset and lots of very good silhouette opportunities. At Bosque even the clear sunsets can be great if you know where to be. We went out of the box in the pre-dawn foregoing the traditional strategies to go for cranes in orange as detailed in my Bosque Site Guide. Coming soon: a free Bosque Site Guide update for all: The State of the Bosque…. Today’s blog post, the 361st in a row, took 4 hours to assemble (including the time for the DPP 4 RAW conversions and the image optimizations) and was published from my hotel room in Socorro, NM at 4:21am. We will be enjoying a busman’s holiday until we meet the 4-Day Bosque IPT on Saturday afternoon. Denise and I will again be collaborating on two Bosque IPTs in 2015, one before Thanksgiving and one after. Dates and rates will be announced here soon. If you would like to receive early notice, please shoot me an e-mail with the words “Bosque 2015” in the Subject Line. Thanks a Stack! The last six weeks have been great! The last six weeks have been quite rewarding with more and more folks making it a habit to use my B&H links especially for their major gear purchases. It is great to feel appreciated. Thanks a stack to all who used our links for purchases large and small. 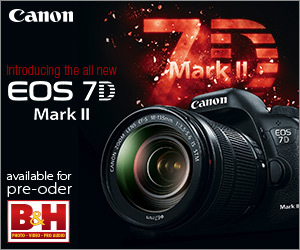 B&H has a limited supply of Canon EOS-7D Mark II bodies in stock. They are ready to ship you one today. Take part in the revolution. Need reach along with a great AF system and superb image quality? Order yours today by clicking on the logo link below. If what you’ve learned here on my blog about the Canon EOS-7D Mark II has inspired you to purchase this great new camera body, please consider using the logo link above to support our efforts here in bringing you the latest, greatest educational materials on daily basis. This image was created at Bosque del Apache NWR at 6:40am, also on November 24, 2014 on Day 1 of the 2-Day Creative Workshop with the with the Gitzo 3532 LS carbon fiber tripod, the Mongoose M3.6 head, the Canon EF 200-400mm f/4L IS USM Lens with Internal 1.4x Extender (at 329mm) and the Canon EOS-1D X. ISO 800. Evaluative metering +2/3 stop as framed in Av Mode: 1/400 sec. at f/4. Color Temperature: 8000K. Central sensor/AI Servo/Surround–Rear Focus AF as framed active at the moment of exposure. Click here to see the latest version of the Rear Focus Tutorial. Click on the image to see a larger version. After a huge fly out against so-so color we ran into a Bald Eagle on a nice perch tree just as the color developed. I enhanced the colors a bit with the Adjust Image Colors tab in DPP 4. 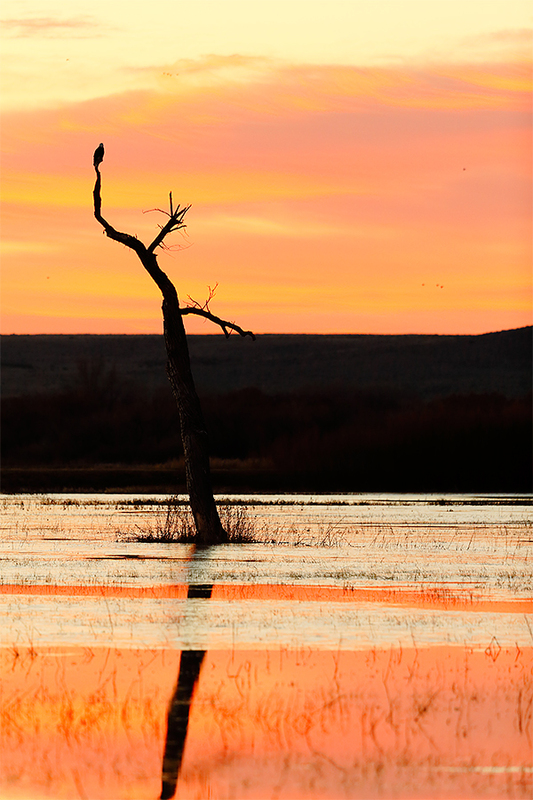 This image was created at Bosque del Apache NWR at 7:58am on November 24, 2014 on Day 1 of the 2-Day Creative Workshop with the with the Gitzo 3532 LS carbon fiber tripod, the Mongoose M3.6 head, the Canon EF 200-400mm f/4L IS USM Lens with Internal 1.4x Extender (with the internal TC in place at 533mm) and the Canon EOS-1D X. ISO 100. Evaluative metering +1 stop off the yellow grasses in Manual Mode. 3-stop drop-in (0.9) ND filter. We hope to have more info for you on the Singh-Ray 3-stop drop-in (0.9) ND filter soon. 1/30 sec. at f.5.6. AWB. We have enjoyed some great blackbird blastoff action most every day at the north end of the Farm Loop. For many in the group it was their first time attempting to create pleasing blurs. Everyone did better than just fine. Singh-Ray filters have been used by the world’s top photographers for many decades. Who? Art Wolfe, Tony Sweet, John Barclay, my new friend Ian Plant, my BFF and oft-business partner, Denise Ippolito, Nevada Weir, Brenda Tharp, Cole Thompson, Chuck Kimmerle, and the late Galen Rowell among others. Singh-Ray has been and is the name in quality filters. I often use their 77mm warming polarizer set to dark at Bosque to get to a slower shutter speed in too-bright conditions and to tone down that fierce sun. BIRDS AS ART is working with Singh-Ray to produce a 5-stop Neutral Density filter to to fit the filter drawers of Canon Super-telephoto lenses. Staye tuned for info on that. No other filter manufacturer comes close to matching the quality of Singh-Ray’s optical glass that is comparable to that used by NASA. And they continue to pioneer the most innovative products on the market like their ColorCombo polarizer, Vari-ND variable and Mor-Slo 15-stop neutral density filters. When you use their filters, you’ll create better, more dramatic images and, unlike other filters, with absolutely no sacrifice in image quality. All Singh-Ray filters are handcrafted in the USA. To shop for a Singh-Ray 5-Stop ND filter (for example), click on the logo link below, click on Neutral and color density on the menu bar and then click on Mor-Slo 5, 10, 15 and 20-Stop Solid Neutral Density Filters. I go for the 77mm thin-ring 4.6mm (no front threads). This filter fits the 77mm lenses like the 70-200 f/2.8L IS and the 100-400. It is perfect for getting down to shutter speeds in the 1/8 to 1/30 sec range in Bosque’s seemingly omnipresent bright sun while working at relatively wide apertures. Now add to your cart and then checkout. At checkout, type artie10 into the “Have a coupon? Click here to enter your code” box, and a healthy 10% discount will be applied to your total. In addition to enjoying the world’s best filter at 10% off you will be supporting my efforts here on the blog. This image was created at Bosque del Apache NWR at 7:58am on November 24, 2014 on Day 1 of the 2-Day Creative Workshop with the Gitzo 3532 LS carbon fiber tripod, the Mongoose M3.6 head, with the Canon EF 600mm f/4L IS II USM lens and the Canon EOS 7D Mark II . ISO 400. Evaluative metering +1/3 stop off the blue sky 30 degrees up from the horizon: 1/3200 sec. at f/7.1 is the equivalent of our oft-recommended settings for bright whites in full sun: ISO 400, 1/2000 sec. at f/8 for and check your histogram. Some bodies might need 1/2500 sec. at f/8. Others rarely might need 1/3200 sec. at f/8. Shutter button AF for nearly all pure flight situations. Click on the image to see a larger version. With the wind from the west/northwest decent flight opportunities were few and far between. When they came along the 7D II was more than up to the task. Whenever I need additional reach, I reach for my 7D Mark II. AF has proven to be superb. 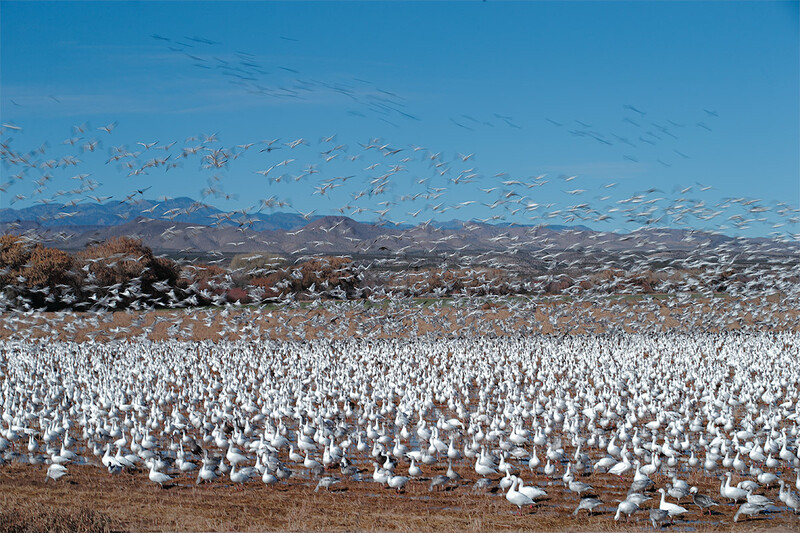 This image was created at Bosque del Apache NWR at 10:54am on the sunny morning of November 24, 2014 on Day 1 of the 2-Day Creative Workshop with the Canon EF 70-200mm f/2.8L IS II USM lens (hand held at 80mm) and the Canon EOS-1D X. ISO 50. Evaluative metering +1/3 stop as framed: 1/15 sec. at f/13. Cloudy White Balance. Singh-Ray 77mm 3-stop (0.9) Neutral Density filter allowed me to get down to 1/15th sec. in full sun without having to work at a tiny aperture that would have maximized dust bunnies. One sensor up from the central AF point/AI Servo/Surround–Rear Focus AF as framed was active at the moment of exposure. Click here to see the latest version of the Rear Focus Tutorial. Click on the image to see a larger version. We waited nearly 3 solid hours for the massive blastoff that seemed a near-certainty at 8:45am. It never happened…. This half-assed blast off was the best that the hungry birds could manage. Where is a coyote when you need one? We stayed were pretty darned patient but gave up at 11:30am and headed back to Socorro for lunch. This image was created at Bosque del Apache NWR at 3:37pm on the partly cloudy afternoon of November 24, 2014 on Day 1 of the 2-Day Creative Workshop with the Canon EF 70-200mm f/2.8L IS II USM lens (hand held at 155mm) and the Canon EOS-1D X. ISO 50. Evaluative metering +2/3 stop: 1/8 sec. at f/4. Color temperature: 8000K. Central sensor/AI Servo/Surround–Rear Focus AF on a tree in the center of the frame, release, re-frame lower, and pan vertically upwards during the exposure. Click here to see the latest version of the Rear Focus Tutorial. Click on the image to see a larger version. Many on the Creative IPT were hot for trees so we obliged. 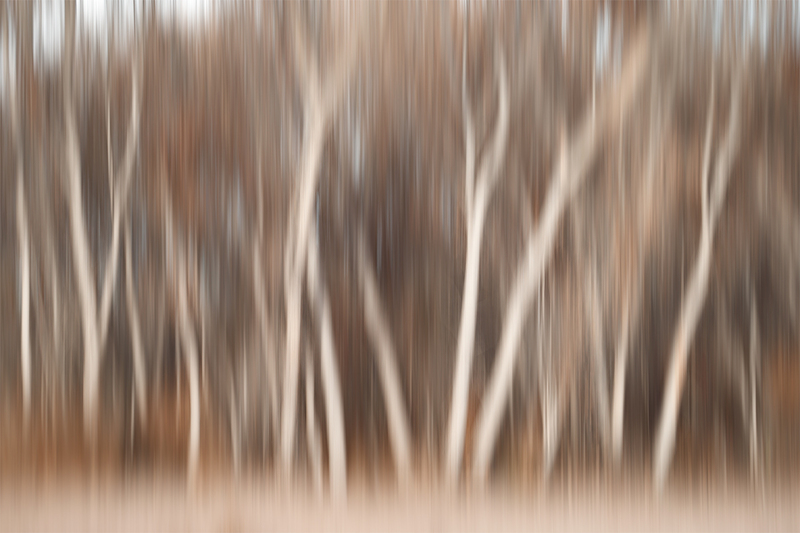 We discussed a variety of techniques including vertical pan blurs (as here), zoom blurs, and shiver blurs. While lying in bed in the middle of last night and thinking of finishing this blog post, I realized that the two oof bird images were actually de-focused blurs, one of the many categories that we discuss and detail in our great eGuide, A Guide to Pleasing Blurs by Denise Ippolito and yours truly. 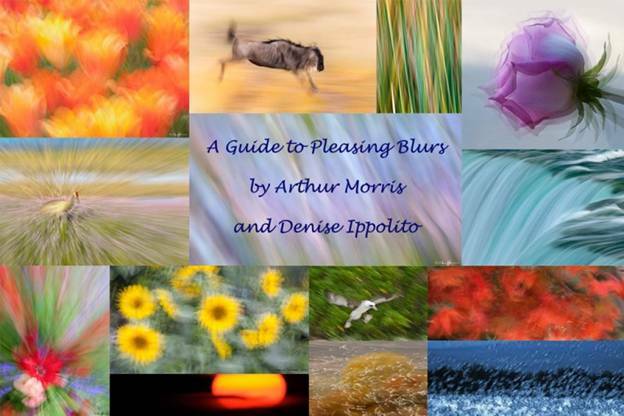 Pleasing Blurs are not accidents. Learn pretty much everything that there is about creating them in this instructive (as always) guide. 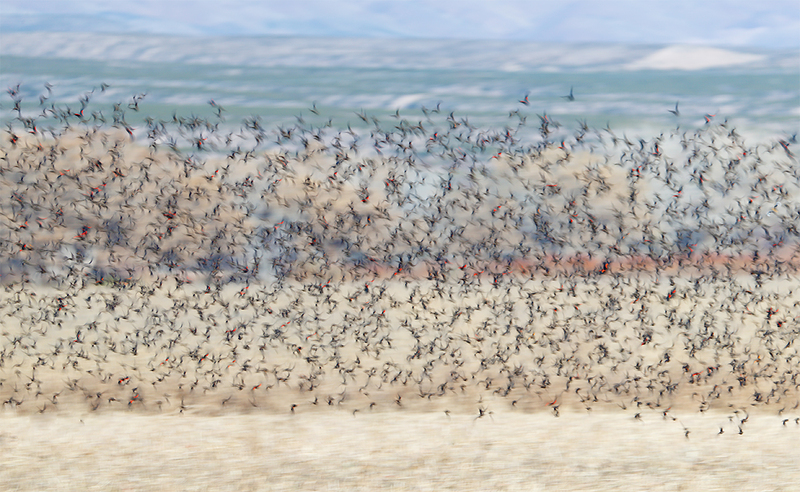 This image was created at Bosque del Apache NWR at 5:00pm on November 24, 2014 on Day 1 of the 2-Day Creative Workshop with the Canon EF 70-200mm f/2.8L IS II USM lens, the Canon Extender EF 2X III (hand held at 178mm) with the Canon EOS-1D X. ISO 2500. Evaluative metering -2/3 stop: 1/500 sec. at f/5.6. Color temperature: 8000K. As the sun set in the west behind the Chupaderas it seemed as if the earh behind them had caught fire. Birds in the color were frustratingly few and far behind. Why -2/3 EC for this one? Which of today’s six images float your boat? Which do not? Either way, let us know why. Artie, I like them all. The eagle at sunrise and the snow goose preparing for landing (gear down, flaps down, maximum aerodynamic braking) are my favorites. The Blackbird blast-off is spectacular! The sunrise silhouette with the black “bar” of the mountain always turns me off in Bosque images . 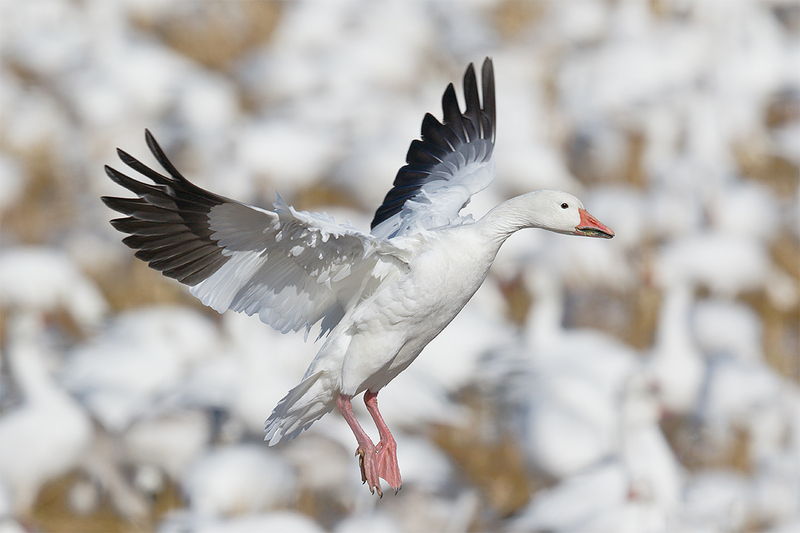 My favorite of all your photos is the ability to handle :whites” especially in bright sunshine as shown in the snow goose landing shot. Personally I get caught up in the moment and constantly screw up whites even after looking at histogram . Oh well another excuse to get outside and try again and again and again ! 1/2500 sec at f/8 at ISO 400 for bright whites and check your histogram for blinkies should do it…. Hi, Artie. Pretty sunrise this morning, November 26. Was the following exposure information under the landing goose an escapee from the blackbirds image? “as framed: 1/15 sec. at f/4 in Tv mode. Color temperature: 8000K.” The blackbirds image had no exposure information. 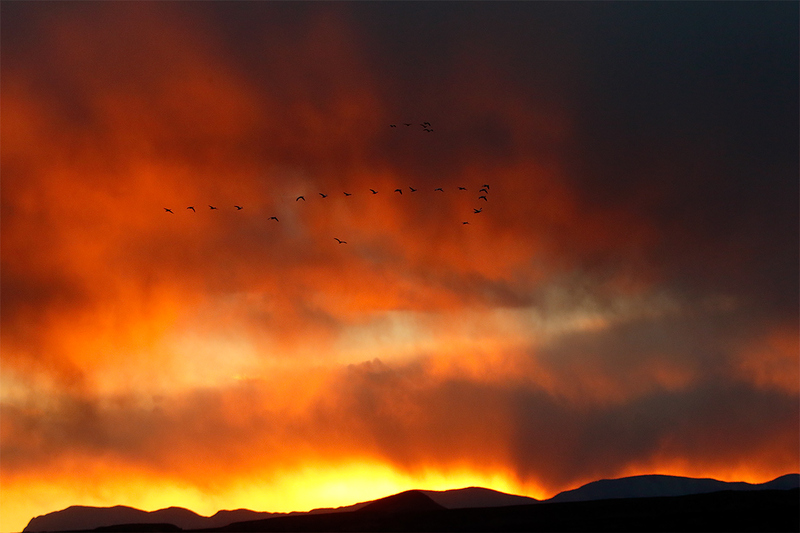 My favorites are the blackbirds and the sunset with high geese. I don’t know why you went with – 2/3 EC; I find that doing that can make sunsets more dramatic, which is why I do it sometimes. Pretty is a vast understatement. Thanks for catching the cut and paste left-over. The yellow flaming sky right above the mountain, I’m guessing. Thanks. In any case, it’s a lovely image. I wish you and your group a very Happy Thanksgiving. I hope you have a great day tomorrow!